A good snack to hold you over until lunch or dinner. Combine butter, cheddar, Worcestershire and sesame seeds. Make sure it’s mixed well. Next add flour, a little at a time. Knead. Form into a long roll about 1″ in diameter. Cut into 1/4″ slices. We’ll be hosting our Job Fair on Saturday, February 4, from 9:00 – Noon. 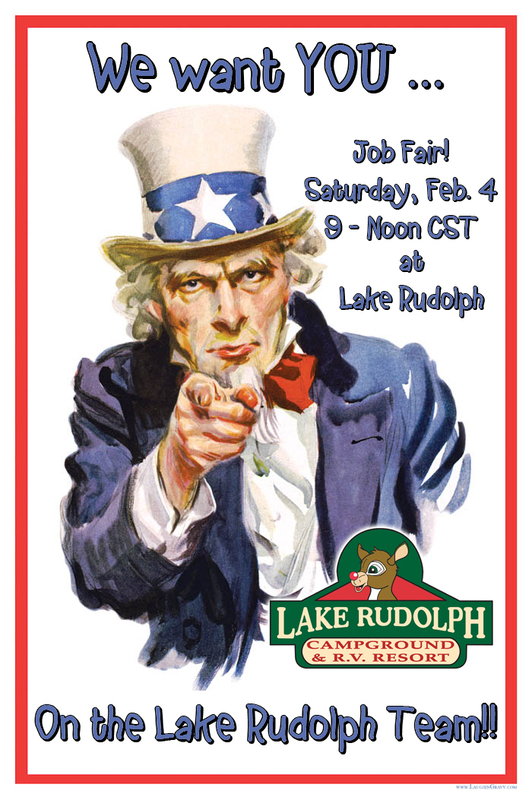 One change this year … we’ll be holding the fair here at Lake Rudolph! Seasonal positions are available at Lake Rudolph in the following areas: Activities, Housekeeping, Blitzen Kitchen, Maintenance, Grounds, Call Center, Welcome Center, Camp Store, Lifeguards, Security, and Shuttle Drivers. You can talk with representatives from each department and ask questions. If you plan to attend the Job Fair, arrive at the main entrance and we’ll direct you where to park. All applicants are welcome! This is a great opportunity for college students, high school students and retirees. Applicants must be at least 16 years of age, with some positions requiring you to be older. The road is cut for the expansion of our Rudolph’s Christmas Cabins! Can you tell where they will be located? The new road connects off of Snowball (near Dasher Bathhouse 2) and runs up to connect to Dash Way.